On Monday, Nokia confirmed the news that it will be coming back to the smartphone market once it has freedom from the policy signed during the Microsoft deal. As per the documents, Nokia should not manufacture or sell Nokia branded smartphones until the end of fourth quarter of 2016. To get back in to the mobile business company had a one easier way, that is to sign a licensing deal with new partner. Nokia is looking for a world-class partner to manufacture, market and sell the smartphones under the brand ‘Nokia’. It was same as what Nokia and Foxconn partnered to manufacture and sell the Android-powered Nokia N1 Tablet. Due to the deal with Microsoft, Nokia can’t sell the smartphones under its brand name until the end of 2016. Even the customer support also to be handled by the partner only. Meizu, a Chinese smartphone manufacturer, teased an image mentioning the date 7.29 and words “the long era of intelligent machines 1110”. The company also sent out the media invites for the launch of its mid-range device M2 Note, which also contained the Nokia’s popular 1110 feature phone displaying the launch date of M2 Note as 7.29. 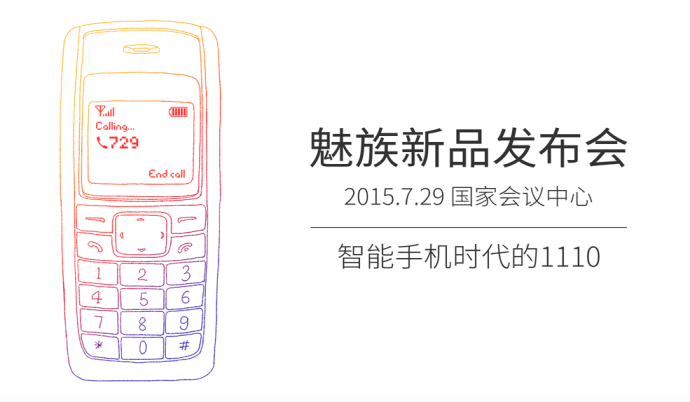 With these posts, we are to believed that there will be a partnership evolving between Nokia and Meizu. Earlier this year there were rumours that these two companies are working on Meizu’s flagship device MX4 Supreme, but Meizu’s VP of Science and Technology, Li Nan denied the reports. But it seems like now both the companies will be working together in some project. The finland-based company will be handling the design and technology of the device,s while Meizu looks after everything else including the manufacturing. In case you missed, Meizu did its quota of this year for a flagship device, as company recently launched Meizu MX5 in an event held in Beijing. To jog up your memory, the metal build device sports 5.5-inch Full HD (1920×1080) display and comes powered by MediaTek Helio X10 True octa-core processor clocked at 2.2GHz. It comes with 3GB of RAM, 20.7MP rear camera with dual LED flash and a 5MP front camera. It runs on Android 5.0 Lollipop based Meizu’s Flyme OS 4.5. The basic version with 16GB internal storage is priced at CNY 1,800 (Rs 18,400) which can be a very good considering the specifications it offers. Not to forgotten, the company also embedded the fingerprint scanner into the physical home button for better security.